View of “Garden of Memory,” 2018. Weaving together poetry, sound, and sculpture, “Garden of Memory” styles itself as a conversation à trois between artists who are bound by friendship and love. Poet and painter Etel Adnan serves as the link among her longtime collaborators Robert Wilson and Simone Fattal, both of whom she met for the first time in the summer of 1972 in Beirut. Her poem Conversations with my soul (III), 2018—here read aloud by Wilson over speakers and heard by Fattal’s sculpted angels—folds into another dialogue, this time between the poet’s different selves. Fitted with a gray carpet that dulls the sound of footsteps and, from the outset, solicits the sense of touch, the gallery feels like an anechoic chamber, one that invites visitors to turn inward. Wilson’s looped, nearly ten-minute reading is set to Michael Galasso’s string music and punctuated by silences that contribute to an overall mood of contemplation. Galasso’s wistful composition, written for Wilson’s adaptation of Henrik Ibsen’s 1888 play The Lady from the Sea—which resonates with the marine imagery of Adnan’s verse—adds yet another layer to the polyphonic whole. 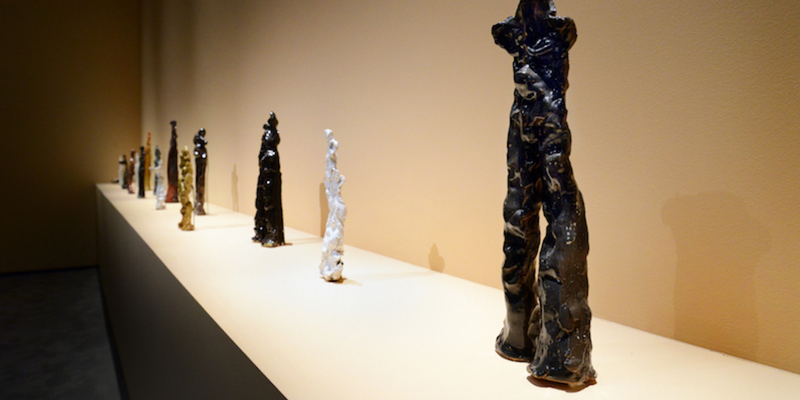 Visually, the show is dominated by Fattal’s sculptures. Inspired by the encyclopedic writings of the thirteenth-century Sufi mystic and philosopher Ibn Arabi and, in particular, by his discussion of angels in The Meccan Revelations, these works take many forms: hollow terra-cotta stelae inscribed with Arabi’s texts, displayed on plinths in sets of two and five; small and large humanoid figures resting on pillar-like legs; and a row of five glazed angels mounted on the circular wall diagonally, as if to convey their flight. Fattal considers the stuff of her sculptures—clay and mud—as living material, and thus a conversation partner in its own right.